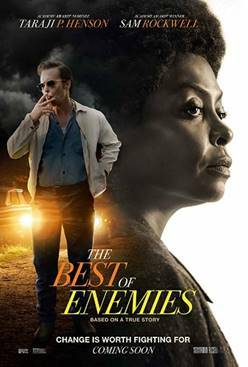 Based on a true story, THE BEST OF ENEMIES centers on the unlikely relationship between Ann Atwater (Taraji P. Henson), an outspoken civil rights activist, and C.P. Ellis (Sam Rockwell), a local Ku Klux Klan leader who reluctantly co-chaired a community summit, battling over the desegregation of schools in Durham, North Carolina during the racially-charged summer of 1971. The incredible events that unfolded would change Durham and the lives of Atwater and Ellis forever. THE BEST OF ENEMIES releases in theaters this Friday, April 5. I had the privilege of pre-screening The Best of Enemies on Wednesday evening and it didn't disappoint. Lately, online conversations on race and racial reconciliation have been highlighted and rightly so. I have had the opportunity to be involved in a few. One thing that I am sure of is that we must also be diligent in having conversation in real life. My neighborhood cul-de-sac is very diverse and we have spent quite a few evenings together. Sharing life together. I am grateful to say that I was able to screen this movie with one of my neighbors. One who doesn't look like me - one whose background is dissimilar in many ways, yet we have found common ground in various areas of our every day lives. In The Best of Enemies, two very prominent Durham, NC figures (for very different reasons) in find themselves in a predicament. I had not heard of this story until I began to see trailers for the movie, so I was intrigued. Thanks to the wonderful people at Eden Media Group, I was able to start a personal conversation with my neighbor by inviting her to be my guest. The movie is emotionally jarring, while evoking compassion for life events that are truly out of our control. I felt the angst of racism's terrible grip, and trembled from depictions of this very real experience happening less than 50 years ago. It was a reminder of the institutional injustices that were commonplace at the time and the far-reaching effects and implications within the educational system currently. What I enjoyed most about the movie is that this story and so many others like it, rebuild faith in humanity and system-wide change. Hate is only as powerful as the link from generation to generation. Once that connection is interrupted, change can truly happen. It takes the work of many to accomplish, and there will be some loss along the way, but that should not deter us in doing our part. Whether it's having conversations with your neighbors, discussions at the dinner table, or before a room full of change agents, we all have a choice to make. I hope you'll consider supporting this film and it's story. The Best of Enemies in out in theaters today! Here's the Trailer for a sneak peek.